The 980-foot-tall skyscraper under construction in the Persian Gulf emirate's capital city may be designed to handle the rough, 105-degree-plus heat of the Arabian summer, but somehow a fire broke out in the tower Thursday morning, causing 2,500 workers to scramble from the site as city authorities rushed to contain the blaze. Civil Defense, ambulances and police rushed to the site to evacuate people from the building while the fire department fought the flames back. Meanwhile, huge plumes of thick, black smoke billowed up the tower's glass and steel facade. 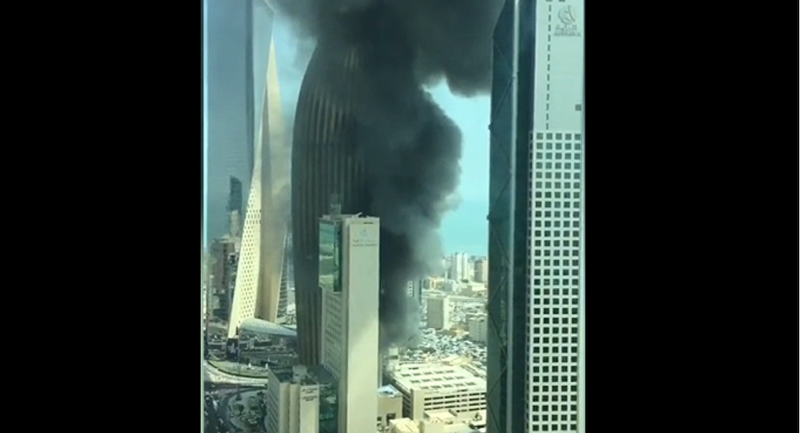 ​The National Bank of Kuwait posted on Twitter that all 2,500 workers had been evacuated and that by the time of their posting, the blaze was already 90 percent contained. The tower is located in Kuwait City's financial district. Note that there has been a partial fire in the NBK headquarter construction site of which 90% has been successfully extinguished by the Kuwait Fire Department. Over 2500 workers were evacuated from the site in a record time with no injuries. Updates will follow. Thank you. ​A spokesperson for the bank confirmed to the press that the blaze is now extinguished and that no injuries were reported. "NBK Management would like to thank the Kuwait Fire Department, the Ministry of Interior, the Emergency Medical Services for their quick response in extinguishing the fire at the new NBK Headquarter construction site and to the public on their concern for the safety of all," the spokesperson said, according to the Star.